Would you like to order a printed version? There will come a time, sooner or later, when even the most ardent fan of French or other cuisines will find a word or phrase on a menu the meaning of which cannot readily be recovered from memory, even if it was there in the first place. 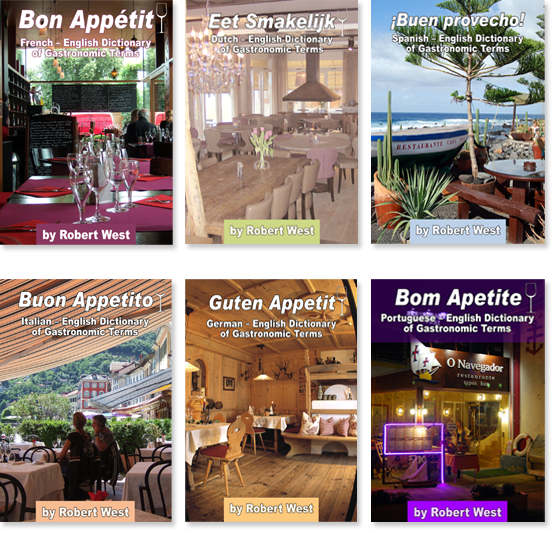 And of course menus are in French not only in France but also in Luxembourg and parts of Belgium and Switzerland, and in German not only in Germany but also in Austria, occasionally Luxembourg and parts of Switzerland and Italy. The purpose of this small volume is to aid the memory, to describe what gastronomic delight, or the opposite, is awaiting those who might order that otherwise unknown. It is also intended to help the adventurous, who seek out new or unusual dishes, to make the most of whatever is on offer. And it aims to avoid those sometimes comical translations often to be found even in the finest establishments. Part of the joy of a meal abroad is the anticipation, the excitement of expectation. That thrill is certainly heightened when you know what you have ordered! If, after eating, you can say that we have been of use in enabling you to enjoy the repast, then we will have done all we set out to achieve. Within days of the last edition of BON APPETIT coming of the printing press, we were finding more terms for entry into the dictionary. Our search is relentless and, of course, assisted by contributions from readers, whom we thank most sincerely. We have now published the latest edition which, you will see, has been renamed. This is to reflect its purpose more simply than previous editions. 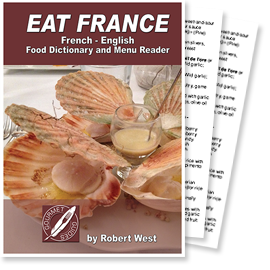 Numerous terms have been added and the book can now proudly boast of being probably the most comprehensive pocket French food dictionary on the market, particularly as it is not “padded out” with terms related to tables, chairs and the like. 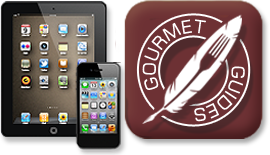 We have concentrated solely on the most important aspect of a meal out, the food! The book normally retails at € 4.99 but you can purchase it here for a promotional price of € 3.99. Please visit the section of this web site entitled “How to order”. This series of gastronomic pocket books is designed in A6 size (148.5mm x 105mm) so that they can be conveniently stowed in a pocket or handbag. They each weigh approximately 50g, and are wire-o bound for easy opening and the ability to lay flat on a table. They have protective plastic covers front and back to prevent wear and tear. We would welcome any feedback as to the design as we are constantly seeking to improve our product where possible. Please feel free to use the feedback forms at the back of each volume, or to contact us by email.